The game contains 8,652 dialogue blocks, containing 60,906 words and 326,952 characters, for an average of 7.0 words and 38 characters per block. The game contains 17 menus, 124 images, and 13 screens. I really like this game. I was about to tear up though. It's only because I'm a big baby and I have a little sister and I know I'll hate myself if something were to ever happen to her. 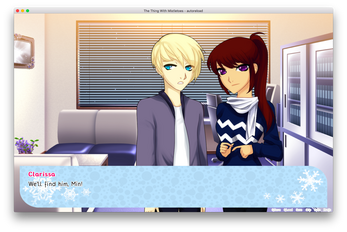 And I just love the 2nd endings. They're so adorable! Yay, I'm glad you loved it! Thank you so much! Haha, awww, that's cute. It's like you have the actual Daniel to hug beside you, yay! Great game Ran. I love this one to! I'm glad to hear that! :) Hope you enjoy playing! First I went through Jake's route, truly such a cutie and kind guy. 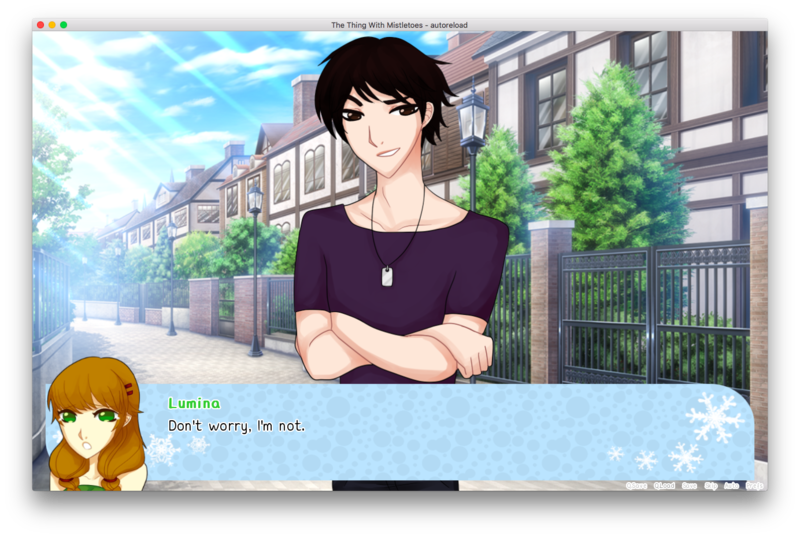 Then Landice's route, shy yet very protective. Then Daniel's very nice backstory, and Gabriel's too. I played through them all again to get the 'secret' endings. It was actually really fun to play it again just to get that little bit more of the story. For a minute I thought you would leave it with an 'Imagine the rest yourself' kind of ending. I, for one hate those. I'm glad I played it and I am waiting for more! (For a fact, I wasn't here since 2013 and I only just discovered this game a couple of weeks ago but I would wait for this type of game, long or short, those 3 years. As long as the developers do what they enjoy and share their creations with their 'fans' I think it's worth as long as it takes). Thank you so much for playing! And I'm really glad that you loved it! I was honestly super scared that the plot would feel too contrived or something, haha. And oooooh, that would be pretty cool, to be honest! Haha, we'll see (though that's quite unlikely for now, sorry). 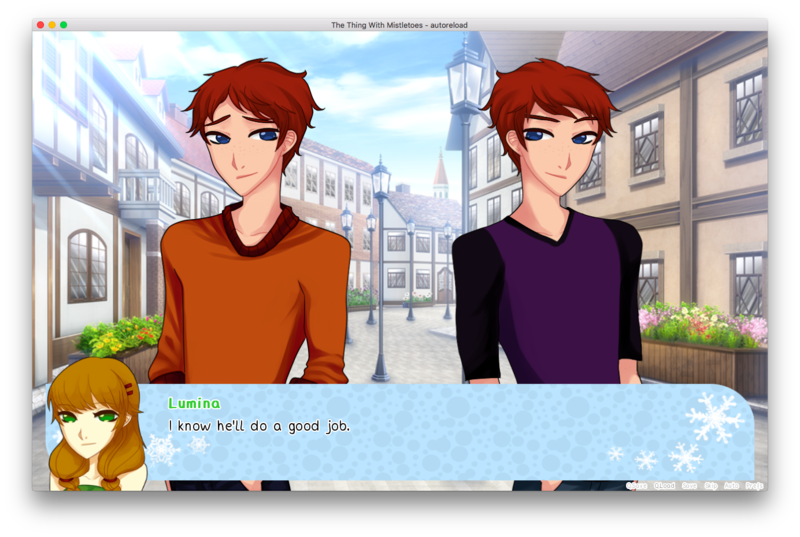 And yay, congratulations for finishing all the routes! Which one is your favorite? And awwwwww, thank you for the kind words! <3 I really appreciate what you said. Thank you so much!! The plot didn't seem contrived at all to me, it seemed to go along naturally. The idea was quite simple in itself but you elaborated on it and it became very unique and interest catching. I get the feeling that Daniel is probably my favourite...or on the same place as Landice...and Gabriel...And Ja-- OK OK, hmm, probably Daniel though? I loved all of them so it's a tough choice but yeah, Daniel seemed, how do I say this, he stood out to me and I felt sorry he had to stay inside and felt the way he did but he still grew up to not be hateful or too envious and, instead, became someone good and kind. Aww, thank you so much for the thoughtful response! Haha, it's nice to hear that Daniel's got a fan! Most people I've asked preferred Jacques, hehe (oh sorry, I mean Jake. He dislikes his real name, lol). But yet, Danny's a sweetie like that. The PC version download isn't working.